If you’re an outdoor grilling purist and believe there is nothing better than slowly cooking meat over exposed flaming charcoal, I advise you to look away now. If, however, you are a technophile who is willing and better yet, excited to embrace the latest advances in outdoor grilling, read on, because you are going to love Green Mountain Grills Davy Crockett Pellet Grill. It all started with Traeger and Louisiana Grills and in the early days of the pellet grilling revolution, they were the only options in town. Along came Green Mountian Grills in 2008 when they started offering exciting technology and competitive pricing. Then in 2014, Green Mountain made the decision to markedly reduce the prices of their consumer models making them a top option. With their recent addition of the small and portable Davy Crockett Pellet Grill model, things got even better. With its small footprint, portability and multiple powering options, Green Mountain has become one of the leaders in the pellet-grilling arena. The folks behind Green Mountain loved pellet grilling so much, that it became their preferred method to gas and charcoal grilling. But they were unhappy with the performance and features of pellet grills that were currently on the market at the time. They started envisioning ways that they could make improvements and ultimately decided to start making their own. Since then, they have made it their mission to go to great lengths to bring awesome and innovative features to all of their grills. Like most things available in 2017, the Green Mountain Grills Davy Crockett Pellet Grill comes Wi-Fi enabled. I know that may seem like a frivolous novelty included only to jack up the price, but it actually serves a pretty logical (and in my opinion a pretty awesome) purpose. As any experienced outdoor griller will tell you, it is imperative that you pay constant attention to the temperature of your grill. Taking your eyes off the thermometer for more than a few seconds could result in your burgers, hot dogs, and steaks being burned to a crisp. This, of course, means that the person behind the grill rarely gets to partake in any barbecue festivities. 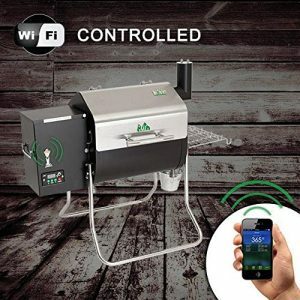 Thanks to the Davy Crockett’s Wi-Fi feature, you will never have to worry about keeping constant watch over the temperature of your grill again. 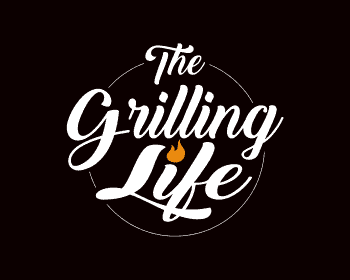 When the grill is synced to Green Mountain Grill’s easy to use iOS and Android app, the temperature can be monitored and adjusted through your smartphone, giving you more freedom to interact with your friends and family. 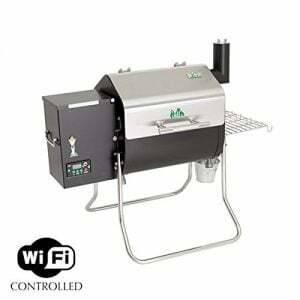 As far as I can tell, there is not another pellet griller even close to Green Mountain’s price range that is WiFi enabled. Through the downloadable app you will get error and low fuel notifications, be able to control internal cooking temperatures, monitor meat temps and turn the cooker on and off. You can even save cooking profiles from your top recipes. Never again miss the big play from the game on TV. Better yet, go relax by the pool while your food is cooking. This opens up a completely new dimension to multitasking while grilling. Getting an accurate idea of the internal temperature of meat as it cooks can be a challenge for even the most skilled outdoor griller. While there are plenty of meat probes available from your local hardware stores, they are often inaccurate and expensive. The folks at Green Mountain Grills had the foresight to fit the Davy Crockett with a sturdy and reliable meat probe that easily connects to your digital controller to give you timely and precise measurements of your food’s internal temperature. You can feel secure in knowing that you will never serve dried out, overcooked meat again. From incredibly high-tech features to basic yet useful extras, the Davy Crockett Pellet Grill has you covered on all bases. Convenience trays certainly fall into the category of “basic, yet useful extras,” but the number of grills on the market that don’t include one would surprise you. Even some of the high-priced grills don’t offer you the luxury of a convenience tray, a consequence of the design team being so caught up in the inclusion of innovative features that they neglect basic necessities. Thankfully, Green Mountain Grills thought to include both the innovative and the simple when putting the Davy Crockett Pellet Grill together. A handy metal side tray provides you with a wide space to store your knives, tongs, and other utensils when not using them. It is also great for food prep and holding your sauces for marinating. Finding a way to including this handy feature to such a small and portable cooker is yet another testament to the abilities of the Green Mountain design team. If you are familiar at all with pellet grillers, then you know their limitations when to comes to searing meat. The Davy Crockett comes with an innovative two-piece grease tray that when placed in the opened position can be used for open flame, high heat, direct grilling. Just like that, the searing problems are solved. Simply move it back to the closed position for super effective indirect smoking. The Davy Crockett is the quintessential and ultimate portable pellet grill. It is a campers or tailgaters dream! It can be transported, moved or stored easily with two people making it one heck of a versatile grill. There are no wheels or casters. Just two sturdy “spring feet” fold up legs that convert to carrying handles with a simple push of a button. Moving it from home to the car or from the car to the campsite is easier than ever. This is quite the respectable grill designed especially for mobile use. 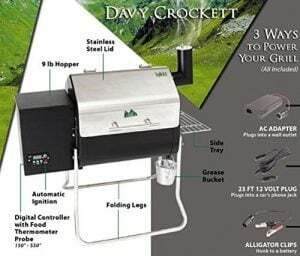 When fully set up, (it takes less than 20 minutes to initially set up this grill up as it comes mostly assembled) the Green Mountain Grills Davy Crockett Pellet Grill has a height of 31 ¾” and a width of 34”. It also boasts a surface cooking area of 219 square inches and weighs just 57 lbs. When its legs have been folded up and its aforementioned convenience tray packed away, the grill can easily be transported in the trunk of a car or the back of a truck. The Davy Crockett is a popular choice among those who frequently find themselves cooking for large groups of people. It is often used for camping trips, extended hunting sessions, and music festivals. 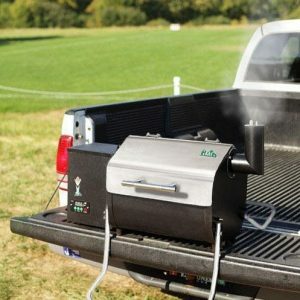 Green Mountain Grills has even promoted it as the “Ultimate Tailgating Grill,” a title that is pretty hard to argue with. When you think about an electric grill, mobility is not one of the first things that come to mind. A lot of people avoid electric grills because they can be quite difficult to power when on the go. You know exactly what you need when you cook with a gas or a charcoal grill, but with an electric model, you must find the right outlet for the unit, which is often easier said than done. Finding a suitable source of power for the Davy Crockett Pellet Grill is significantly easier than many would imagine. The grill features multiple powering options, allowing you three different methods to give it life. If you are cooking at home or near any building with an accessible wall outlet, you can use the included AC adapter to connect your grill to the power source. If you are too far removed from an outlet, the Davy Crocket can be powered using the 23’ 12-volt plug which connects to your vehicle’s phone jack and is also included with the grill. Finally, you can use a pair of alligator clips—yes, they’re included too—to power the grill from your car battery. The two latter options are quite convenient for tailgating, camping or emergency scenarios. Awesome Right? As far as support goes, this pellet cooker rates highly in the Support and Customer Service category. They are known for informative and friendly interaction with customers. They offer phone and email support or if you prefer, you can browse to their website for the online FAQ page and user’s manual. Lastly, they offer a 2-year limited warranty that covers defects in workmanship and materials. If there is one downside of the Green Mountain Grills Davy Crockett Pellet Grill, it is its price tag. Owing to its many innovative features, this grill tends to be slightly more expensive than many models, which will likely pose a threat to the household budgets of many a potential griller. That being said, those who do purchase this grill can be sure of a top-class performance for years to come. It is guaranteed to give you delectable meats for Super Bowl after Super Bowl after Super Bowl. The Green Mountain Grills Davy Crockett Pellet Grill may be a little on the pricey side, but if you ask me, it’s worth every penny. For a one off—though admittedly hefty—price, you get a grill which has the ability to connect to Wi-Fi and allow you to monitor, reduce, and increase temperatures through your phone. This is a feature which outdoor grillers could only dream about 10 years ago. Hell, if you brought it up 5 years ago you would have been laughed out of the tailgate party. But it isn’t just the high-tech features that make the Davy Crockett worthy of your money. It’s the speed at which it allows you to prepare countless different types of meat. It’s the ease with which it can be transported from place to place, and it’s the flexibility through which it allows you to put your own stamp on barbecue classics. It is a solid and handsome looking, fairly priced unit. It smokes and grills as well as most bigger models and offers a feature rich cooker without the unnecessary bells and whistles. You can read more about pellet grills in my “What is a Pellet Grill? – An Introduction to Pellet Grilling” guide. As always, if you or someone you know is in the market for a pellet grill, or you find this information useful, please consider sharing it with your grilling friends or on social media! If you would like to leave a comment or have your own opinion on the Green Mountain Grills Davy Crockett Pellet Grill to share, please do so below. We always welcome your input.